Quite often people get confused between these two major aspects of the training: 1) Learning how to fight and 2) Training for a fight. Unaware of the difference, people get stuck in a high or in a low gear without progressing or enjoying the training and its benefits. More concerning are some cases when people get discouraged or injured because they cannot separate or have these aspects available in their training in a balanced way. In the first aspect, “learning how to fight,” you must study the primary defense mechanisms and attacks from as many different sequences and angles as possible. Here is important to be open-minded to learn how to deal with situations or position that are unusual for you to go to or favor. It will assist you in the comprehensive development of your fighting abilities, specially the ability to stay safe and injury free. As mistakes are likely to occur, it is important to take the training to a different channel without worrying about winning every position rather focusing on how to deal with the next step and where is the best place to go when it did not work. To minimize the mistakes or calculate them, I advise to choose a speed and resistance that you can control to safely apply the techniques versus going all out without a direction or a goal to keep random mistakes to a minimum, or at least give you the opportunity to realize where the position went wrong and fix it. Another reason to regulate how fast or hard you will go at this point of your training is that it will facilitate the development of your tactile sense, or commonly known as the “sense of feeling”. Tactility is a key factor for all Jiu-Jitsu practitioners. It enables you to be responsive to the stimulation of the sense of touch. As we use the sense of touch a lot more than any other sense when we are fighting at close distance, it is crucial to be sensitive, to feel and able to read what your partner or opponent is offering you. This regulation also enables you to achieve the so coveted “muscle-memory” that lets you trace the movements and applications you have been working and perform them efficiently and effortlessly. In my previous blog entry “The X factor in your training,” I talk a little more about how to improve and speed up your learning process. Please read it here. The second aspect, “training for a fight,” must occur in designated classes, such as an all-level class, advanced class or competition training. In these training sessions you should “roll” or train with as many different partners as you possibly can. It is good and at times it is preferable to train with partners of the same or approximate weight, but training with partners of a much higher or lower weight class is just as helpful, especially in learning how different body structures offer different challenges and dynamics during the fight. This training must also evolve around the rules of the fight or competition you are preparing for. It is recommended to use the IBJJF rules and all other major tournaments for those sessions being held during the off-season. 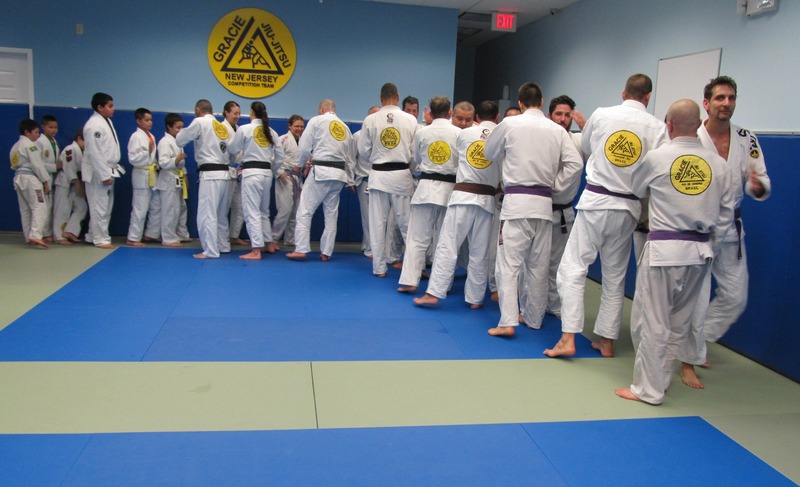 As most tournaments are organized by age, weight and belt rank everyone should be welcome to participate in this kind of training, including white belts that already have put some time and have gained experience on the mats to safely train. Even those not wishing to compete are welcome to attend and support those preparing for the fight, as they will benefit from the training themselves. At this point, the dynamics of the training are quite different from a regular class where we “learn how to fight.” The focus here is to create the conditions you would face in a competition and prepare you for it. It helps if you already have or are in the process of developing a good rapport with your teammates and create a mutual agreement to help each other to train hard and grow. As you “battle” with your teammates, it is important to remember that you are not competing against them; rather you are using them, as they will be using you, to improve yourself from where you were previously. Here your fight is to improve your past position, where you were yesterday, where you are today and the goals you have set for tomorrow. To finalize, I encourage you all to give these two aspects of the training a chance. They are both equally important and together will help you expand your knowledge on the sport and explore your potentials. Not sure how to start? Begin by “learning how to fight” and eventually the next aspect will present itself. Remember to choose the right environment. This might be the only freewill you will have. Once you have decided on an academy, this environment will be providing you or not with the right training for your needs and goals.